The President’s budget estimates it would reduce debt to 71 percent of Gross Domestic Product (GDP) and deficits to $202 billion (0.6 percent of GDP) under its policies. A more realistic assessment suggests that debt under this budget would actually rise to 88 percent of GDP, and deficits would remain around $1 trillion per year. These figures represent our rough estimates of what the Congressional Budget Office (CBO) might find in its re-estimate of the President’s budget. That there is such a difference should be unsurprising considering the huge disparity between CBO and Administration numbers in the Trump Administration's first two budget proposals. As in past years, the difference largely comes down to economic assumptions. CBO estimates real GDP growth will average 1.8 percent per year over the next decade, in line with other government and private forecasters, while the Administration expects economic growth to average nearly 3 percent per year. These rosy growth assumptions lead the Administration to estimate 9 percent more revenue over ten years and 12 percent higher GDP than CBO does in 2029, and the debt effects are significant. Indeed, even under the Administration's baseline, which incorporates the rapid growth but not the budgetary effects of the President's policies, debt would stabilize at around 80 percent of GDP compared to CBO's baseline that has debt rising continuously to 93 percent by 2029. Simply using CBO's GDP instead of the Office of Management and Budget's (OMB) would raise 2029 debt in the budget from 71 percent of GDP to 80 percent. Also incorporating resulting reductions in revenue would increase it to 87 percent of GDP. This number matches our preliminary estimate put forward in our Analysis of the President's FY 2020 Budget. Other effects are much smaller. We estimate that debt could be slightly higher based on differences in how CBO and OMB score the budget's policies. Based on differences in last year's budget, we expect CBO to find lower savings for several of the Medicare provider payment changes, the student loan changes, farm subsidy changes, and increases in fees charged by Fannie Mae and Freddie Mac. In addition, we expect CBO to continue to not count insufficiently specified savings in the Supplemental Nutrition Assistance Program (SNAP) and Social Security Disability Insurance (SSDI). On the other hand, CBO estimates a significantly lower cost for extending the individual provisions of the 2017 tax law that expire in 2025, and it has estimated higher savings in the past for the budget's repeal and replacement of the Affordable Care Act and medical malpractice reform. After incorporating all of these differences, we estimate that debt in the budget would rise from 78 percent of GDP this year to 88 percent by 2029, compared to 71 percent in the Administration's estimate of the budget and 93 percent in CBO's estimate of current law. Thus, instead of putting debt on a downward path, the budget would result in debt rising throughout the next ten years, though at a slower pace than current law. Deficits in the President's budget would also be much higher under these realistic assumptions than under the Administration's. The White House estimates deficits under its budget would fall from $1.1 trillion (5.1 percent of GDP) in 2019 to $200 billion (0.6 percent of GDP) by 2029. 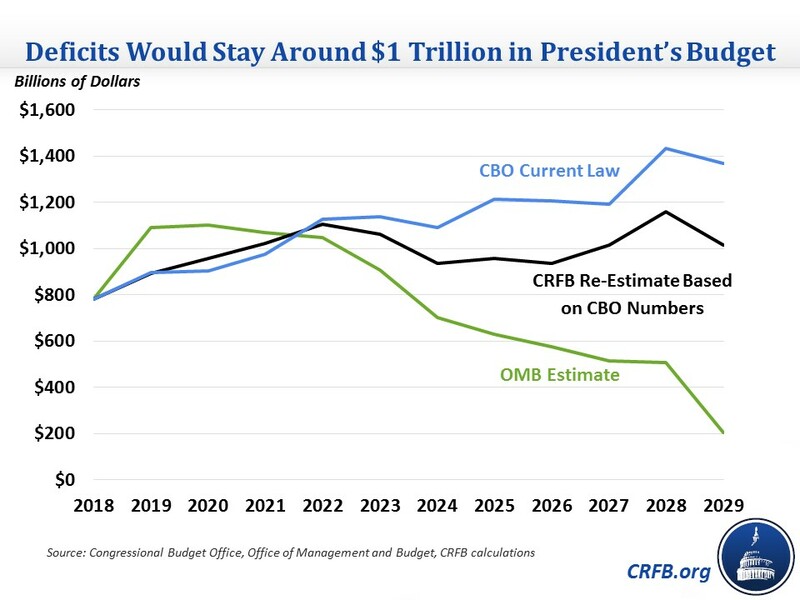 By contrast, we believe CBO will show deficits under the President's budget would remain around $1 trillion per year and rise to $1.01 trillion (3.2 percent of GDP) by 2029. These numbers assume that the budget's unspecified non-defense discretionary (NDD) spending cuts, which reduce NDD spending by 2 percent each year after 2020, will be counted as CBO has done in the past. In a worst case scenario where those cuts don't occur, debt would rise further to 92 percent of GDP by 2029, close to the level CBO projects for current law. Of course, this is just our estimate of the budget based on CBO's numbers. CBO usually updates its baseline ahead of the President's budget, so it will likely have a different starting point than we are using, and its scores will differ to some degree from what we assumed. Still, it is almost certain that CBO will find much higher deficits and debt under the President's budget than what was claimed.